Food Challenge – I'm Here; Right Here. This might seem womanish. But, if you read it till the end you’ll know why its so gentleman like thing to be kind. I am travelling my way back from Home to Hostel at the time of writing this post. It was a five nights stay at home after 3 months of aloofness. And I had already started missing her, her food, her essence. Within these 5 nights, she cooked some twice as much favorite dishes of mine. Now that you know my favorite dishes. When are you inviting me at dinner? But, I genuinely didn’t even ask her to cook these as I used to order before. I turn her world upside down. She’d always be in a hurry. Every time she would be seen into the kitchen. I don’t want to worry her so much. But, what to do? She want me to eat as much as she wants. Oh Sorry. I blabbed so much. I was to write about my feelings upon my favorite food. Right? Ah. I wonder if I could write so much about those feelings that I had never ever felt. Then what would be the urge into writing about those I did feel a lot. This thought has sparked into me a new series of posts for the love of parents. Honestly, I don’t like writing about love of and for parents, online. Why? Because the time I’ll consume in showing my skills in writing online, I’d rather opt to walk to my mother or ring her up and say how much I love her. Every year, for a week, I see people uploading their statuses, photos, upon social networking sites and tell the world that they love their mother only on this occasion of Mother’s day. Mothers are why we are. Mothers are, so we are. Anyway. This world is never going to be a better place. As the name of the title says it. I have been challenged by this beautiful blogger mate accidentallyinked for one of the dissent blog awards I had received till date. A food challenge. I am extremely thankful to her. Getting in the ten bloggers list isn’t easy. Yes, it never is. She wrote it in such an articulating manner that it brought oceans in my mouth. That was hilarious. No? I know. You’re nasty. You’re sassy. No? I know it too. You have to write your feelings not the recipe. You have to add a picture of the dish. You have to nominate 7 persons for this challenge. Everybody has a heart. I’m no different. Like I have never had eaten ‘bitter guard’ and ‘eggplant’. Earlier, I did not even Cauliflower and Lady finger too. But, then someday my Dearest Mom cooked for my Dearest Dad and asked me if I wanted some. I could not refuse. She is love. She is life. If I were to mention all those vegetables that I don’t like then only stuffs like potato, tomato, etc would be spared. Because My Mom knows I don’t like these so, she never did cook. And even if incidentally she cooked one of the above, she would cook a side dish for me alone. But, if all the dishes of this world were to get consumed except those that I don’t like(I know she won’t prepare them still), yet again if she prepares it then I’ll have it for her sake. Yes. This is exactly how I feel. Tehdad Chicken Biryani would definitely be more apt. How my Mom cook? She cooks the chicken and the rice separately. Meanwhile I enter into the kitchen and ask her to add extra Masala to it. Yes, I love it. 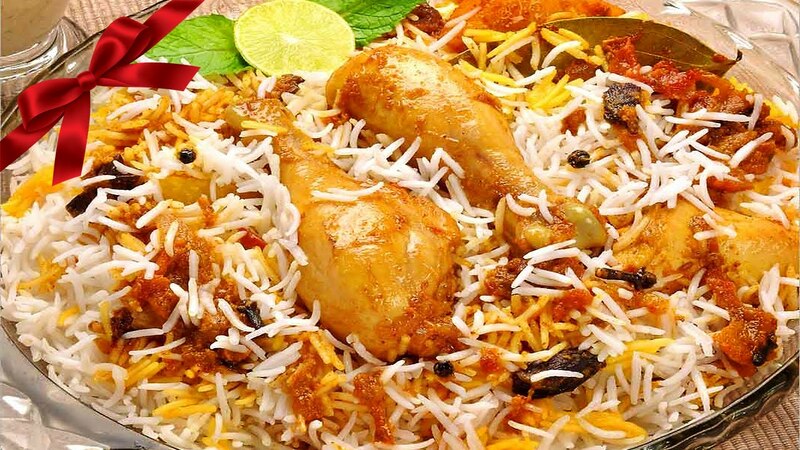 After cooking, layers of rice prepared with sprinkling add-ons of Chicken, Tomato(round shaped), lemon juice, are all spread over it. And in the end, the red fried onion strips are sprinkled all over it. This brings in the extra crispness in the starting bites. Now you’ll realize how womanish this post was. That’s why I am further halting any guy nomination to this challenge by nominating only ladies from my blog follows. I hope you accept my award and wish to response anytime sooner. You in an Indian restaurant. How? When? I nominated you to release you off the idle nature you put forth to award posts. 😀 jk. I wish you’ll do this one. Just asking. Hahah, so you’ve noticed too! I find them time consuming and I honestly have limited time these days. But In Sha Allah, I’m going to-do one of the challenge you’ve nominated me for. Keeping a close eye. Not bad Miss Mahaah. It was very fun to read. 😀 But also torture. 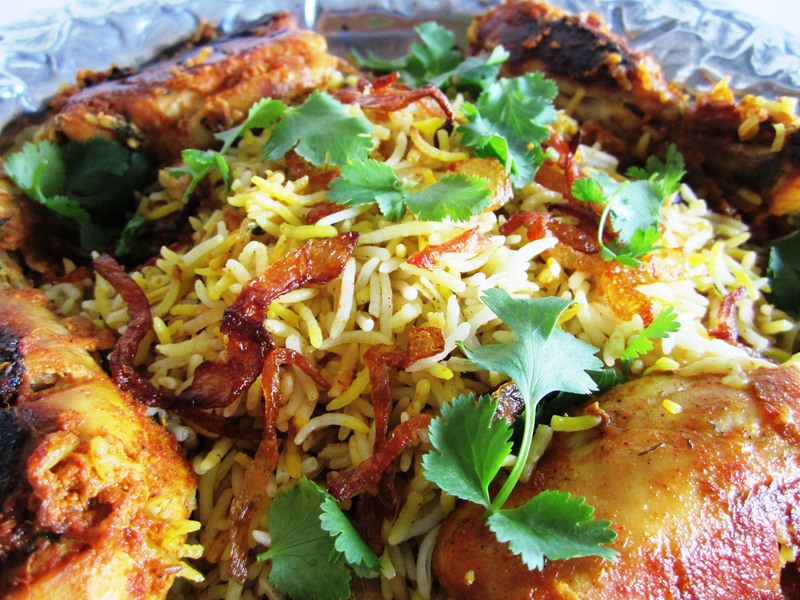 I want Biryani,right now! You’re so right about how sometimes we don’t like some vegetables but then we start liking them. You wait to go back home right? 🙂 For your mother and yummay food! With womanish I meant to say the taste of a normal dish of a women’s hand can never match the men’s cooked cuisines ever. You’re invited at home. Come anytime. Mom is always there. Exactly. I tried making it. Followed everything she said. But, it was no where close to it. I’m happy to nominate you. I’d be really glad to read that come from you. Knowing that you’re a good chef, I find this as cool as the descriptions of judges in MCAus when they make food into literal stuff. In short, this was scrumptious to read. Thanks for nominating me, I’ll try to do this post soon. and as for the post, I am very annoyed for gender-ing food as “womanish”. I guess in your world food preparation is a women thing 🙂 Alas! just kidding – sort of. As for the nomination – thanks 🙂 It’s good to be thought of. As for accepting and rising to the challenge – I will think about it. I had to show the respect I have for you. You’ve been already so kind to me here. I’m sorry. I did not mean womanish in a negative sense. Please. I meant to say that no male chef ever can match the standards of a mother in her kitchen. The taste, the barakah, into everything. Your appreciation of your mother and her love is heartfelt. Keep that up and life will always be blessed. Kindness and respect to parents is one very important aspect of being Muslim.